Upgrade to Stormforce PLUS for total car protection. Want to Buy a STORMFORCE Cover? Now with an upgraded and reformulated outler layer to offer extreme UV Resistance and longer life, Stormforce covers offer the very latest in 4 layer bonded car cover technology and is now available via us in the UK. Upgrade to Stormforce PLUS for the next generation of our most popular outdoor cover. Lap stitched seams are used wherever possible and double stitched hems ensure long life and total outdoor protection. They are suitable for year round use in all weather conditions and are incredibly strong. In very low temperatures, the fabric remains pliable and in strong, hot sunshine they keep interiors cool and protect from top / interior fade, paint damage and other sunshine degeneration. Optional Integrated Car Cover Alarm Pocket and Alarm exclusive to us. 2 x Detachable, Underbody male securing straps with high grade clips. 4 x Soft Silicone Jacket fastener Clip Covers. 4 x Looped Female integrated Car Cover Strap attachments. Elasticated front and rear hems for snug fit. 100% Ultra Ultraviolet Resistant fabric to prevent paint fade and cover life. Side panel eyelets for optional Security Locking Kit. 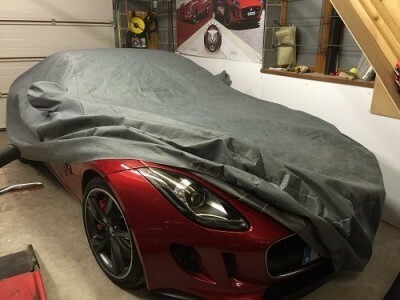 Fitting and Car Cover Care Guide.